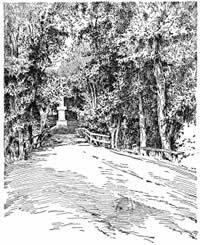 Meantime, the British troops numbering eight hundred men, under Lieutenant Colonel Smith, were on their way to Lexington. But before they had gone far they were made aware, by the ringing of church bells, the firing of signal guns, the beating of drums, and the gleaming of beacon fires from the surrounding hilltops, that their secret was out, and that the minutemen knew what was going on. Surprised and disturbed by these signs that the colonists were on the alert, Colonel Smith sent Major Pitcairn ahead with a picked body of troops, in the hope that they might reach Lexington before the town could be completely aroused. He also sent back to Boston for more men. The British commander would have been still more disturbed if he had known all that was happening, for the alarm-signals were calling to arms thousands of patriots ready to die for their rights. Hastily wakened from sleep, men snatched their old muskets from over the door, and bidding a hurried goodbye to wife and children, started for the meeting places long before agreed upon. Just as the sun was rising, Major Pitcairn marched into Lexington, where he found forty or fifty minutemen ready to dispute his advance. “Disperse, ye rebels; disperse!” he cried, riding up. But they did not disperse. Pitcairn ordered his men to fire, and eighteen minutemen fell to the ground. Before the arrival of Pitcairn the British officers who had captured Revere and Dawes returned with them to Lexington, where, commanding Revere to dismount, they let him go. Running off at full speed to the house where Samuel Adams and John Hancock were staying, he told them what had happened, and then guided them across the fields to a place of safety. 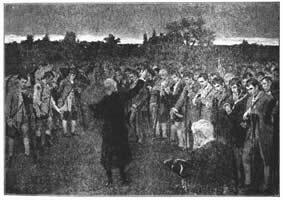 Leaving the shocked and dazed villagers to collect their dead and wounded, Colonel Smith hastened to Concord. He arrived about seven in the morning, six hours after Doctor Prescott had given the alarm. There had been time to hide the military stores, so the British could not get at those. But they cut down the liberty pole, set fire to the courthouse, spiked a few cannon, and emptied some barrels of flour. About two hundred of them stood guard at the North Bridge, while a body of minutemen gathered on a hill on the opposite side. When the minutemen had increased to four hundred, they advanced to the bridge and brought on a fight which resulted in loss of life on both sides. Then, pushing on across the bridge, they forced the British to withdraw into the town. The affair had become more serious than the British had expected. Even in the town they could not rest, for an ever-increasing body of minutemen kept swarming into Concord from every direction. By noon Colonel Smith could see that it would be unwise to delay the return to Boston. So, although his men had marched twenty miles, and had had little or no food for fourteen hours, he gave the order for the return march. But when they started back, the minutemen kept after them and began a deadly attack. It was an unequal fight. The minutemen, trained to woodland warfare, slipped from tree to tree, shot down the worn and helpless British soldiers, and then retreated only to return and repeat the harassing attack. The wooded country through which they were passing favored this kind of fighting. But even in the open country every stone wall and hill, every house and barn seemed to the exhausted British troops to bristle with the guns of minutemen. The retreating army dragged wearily forward, fighting as bravely as possible, but on the verge of confusion and panic. After resting for an hour, the British again took up their march to Boston. The minutemen, increasing in numbers every moment, kept up the same kind of running attack that they had made between Concord and Lexington until, late in the day, the redcoats came under the protection of the guns of the war vessels in Boston Harbor. The British had failed. There was no denying that. They had been driven back, almost in a panic, to Boston, with a loss of nearly three hundred men. The Americans had not lost one hundred. But the King was not aroused to the situation. He had a vision of his superb regiments in their brilliant uniforms overriding all before them. And how did the Provincials, as the British called the Americans, regard the situation? They saw clearly and without glamour the deadly nature of the struggle upon which they had entered and the strength of the opposing army against which they must measure their own strength. The people of Massachusetts for miles around Boston were now in a state of great excitement. Farmers, mechanics, men in all walks of life flocked to the army, and within a few days the Americans, sixteen thousand strong, were surrounding the British in Boston. While the people of Massachusetts were in the midst of these stirring scenes, an event of deep meaning to all the colonies was taking place in Philadelphia. Here the Continental Congress, coming together for the second time, was making plans for carrying on the war by voting money for war purposes and by making George Washington commander-in-chief of the Continental army, of which the troops around Boston were the beginning. Thus did the colonies recognize that war had come and that they must stand together in the fight. Meantime more British troops, under the command of General Howe, arrived in Boston, making an army of ten thousand men. Believing they could be forced to leave the town by cannon planted on Bunker Hill, the Americans decided to occupy it. 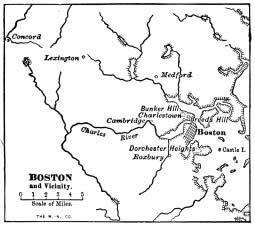 On the night of June 16, therefore, shortly before midnight, twelve hundred Americans marched quietly from Cambridge and, advancing to Breed’s Hill, which was nearer Boston than Bunker Hill, began to throw up breastworks. They worked hard all night, and by early morning had made good headway. The British, on awaking, were greatly surprised to see what had been done. They turned the fire of their war vessels upon the Americans, who, however, kept right on with their work. General Howe, now in command of the British army, thought it would be easy enough to drive off the “rebels.” So about three o’clock in the afternoon he made an assault upon their works. The British soldiers, burdened with heavy knapsacks, and suffering from the heat of a summer sun, had to march through tall grass reaching above their knees and to climb many fences. Behind their breastworks the Americans watched the scarlet ranks coming nearer and nearer. Powder was low, and must not be wasted. Colonel William Prescott, who was in command, told his men not to fire too soon. “Wait till you see the whites of their eyes,” he said. Twice the British soldiers, in their scarlet uniforms, climb the slope of the hill and charge the breastworks. Twice the Americans drive them back, ploughing great gaps in their ranks. A third time they advance. But now the Americans do not answer the charge. There is good reason - the powder has given out! A great rush - and the redcoats have climbed over. But it is no easy victory even now, and there is no lack of bravery on the part of the Americans. With clubbed muskets they meet the invaders. On the other hand, the Americans had fought like heroes, and news of the battle brought joy to every loyal heart. Washington heard of it when on his way to take command of the army. “Did the Americans stand fire?” was his first question.